A month ago, I was given a mandate to take Samsung's hottest piece of portable hardware in the Galaxy S5, take it through its paces, and report on the many insights I gained. And I did. In full honesty, a lot of what makes the Galaxy S5 the phone it is can be traced back to the extremely versatile, abnormally feature-rich TouchWiz Android software overlay. And that's okay as much as it's not -- it just depends on your perspective. Indeed, the typical Android power user will simply love it for the lengthy list of extras, while others will simply feel overwhelmed as options, settings, and deeply-hidden features, are literally everywhere. No matter how inquisitive you feel you are, I guarantee even a month later you'll be finding more pockets of functionality, or basically stuff you didn't know exist in the first place. Again, that can be both good and bad. N.B.! Seeing as the camera is the subject of today's discussion, keep in mind that this an image-heavy piece, so you may have to wait for some stills to load, depending on your connection. Having covered what I believe are essentially all the important features of the TouchWiz software already, including its many faces, today it's about time we talked about the GS5's camera -- an impressive unit that has now firmly perched itself on top of the food chain, at least in our experience. However, as promised, this won't be another in-depth look at image quality (at least not in a major way), but rather an exploration of all the extra shooting modes, options and settings, or the whole shebang basically, along with a final verdict on how well these are implemented, and their relative usefulness in the big picture. So let's get this started. 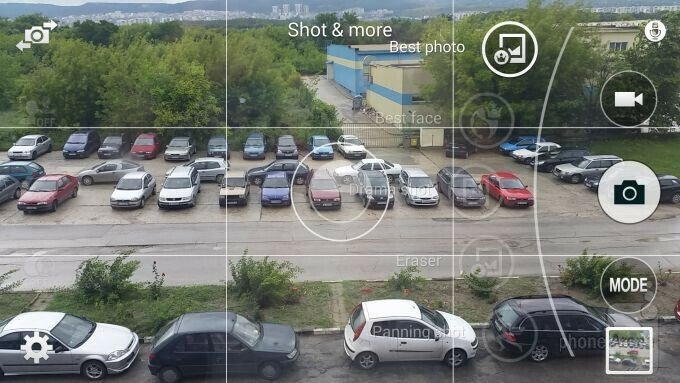 Much alike to all things TouchWiz, the built-in camera's interface is relatively busy. At a first glance, however, things are looking mostly clean, and ergonomics in landscape mode are pretty decent. It's when you fire up the settings that things get overwhelming, and the menu basically hijacks 70% of the screen real estate with row after row of options, some of which rightfully belong elsewhere. What I really dig about the UI, though, is the fact that you can drag and drop certain controls onto the main camera interface (up to 3), and I've found that having the flash controls, along with HDR and Selective focus (which should be a special shooting mode, not a settings option?) right there suits me best, and should probably cover most of you fine, too. 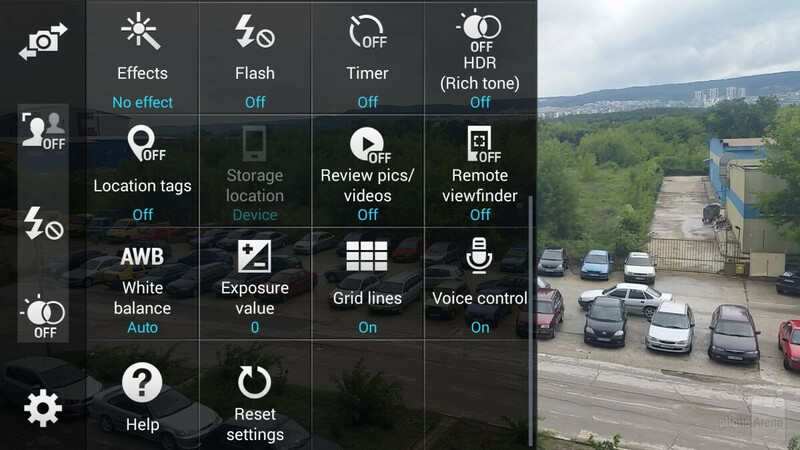 Inside the settings menu, you have controls for things like ISO (up to 800), white balance, metering, and exposure. There are also settings for image resolution, image stabilization, face detection, and even extras like audio zoom (amplifies audio coming from an area you're zooming into). 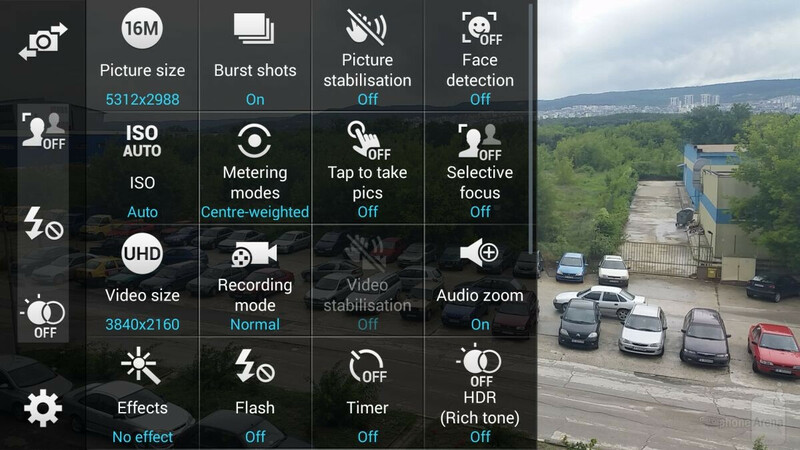 You can also enable Burst shots, which allow you to snap up to 30 snaps consecutively with a long-press of the shutter button, and there are a number of video recording modes, too. I'll be repeating myself here, but it's definitely not wrong to reaffirm just how feature-filled the GS5's camera app truly is, and the plethora of available shooting modes are as much proof as one would need. Where the Galaxy S5 differs from previous Samsung models is the number of shooting modes available out of the box. Surround shot, Animated Photo, Sequence Shot, Sports shot, and Sound & shot -- all of these you'll have to download from the Samsung app store (shortcut available through the download box seen on the bottom right in the image above). The rest is available by default. I'll talk about what most of these offer in turn, but I won't touch on Sports, Sound & shot, and Sequence shot, as I believe these can be mostly covered in a single sentence. Sports, for example, does nothing more than set the shutter speed to super fast (think 1/450), allowing you to capture razor-sharp stills of moving objects. As for Sound & shot, it simply takes a still, and then turns on the microphone for the next 9 seconds, recording all the while (rather useless?). Lastly, sequence shot is nothing more than another way to shoot slow-moes, but these are in a .GIF format. With those out of the way, let's move on. Available for both the rear- and front-facing cameras, Beauty shot kind of gives its function right away with its name. Simply put, all this special shooting mode does is airbrush faces, attempting to give you a less-imperfect skin look. There are 5 intensity levels of the effect, with the lowest barely making any difference, and the highest churning out downright unnatural-looking results. That's probably why, by default, the intensity is set at 3/5, and I've found that to work best. Now beauty shots are something of an Asian specialty in my opinion, and I gather that from the many Chinese phones I've had the chance to work with. That said, there's usually a recurrent problem with their airbrushing techniques that I've not come across with the GS5's. Namely, unkempt beard (like above, I purposefully didn't shave) usually causes a problem (i.e. artifacts) and you get a weird combination of extremely smooth, baby skin-like areas mixed in together with strands of nasty black facial hair. As mentioned, this is not the case with the GS5, though I'm not much for selfies, let alone airbrushing. To this day, Shot & more remains a mystery to me. In theory, this mode is basically a more versatile Burst shot mode, allowing you to snap a number of pictures in a rapid succession, and then pick from them in categories such as Best photo, Best face, Eraser (remove objects), Drama shot, and Panning shot. That said, I am yet to see any but the first two effects light up, so I can't comment on the rest. In any case, I see Shot & more as a simple enhancement over Burst shot, which really is more of a reactionary tool, while the former is better suited for planned execution. 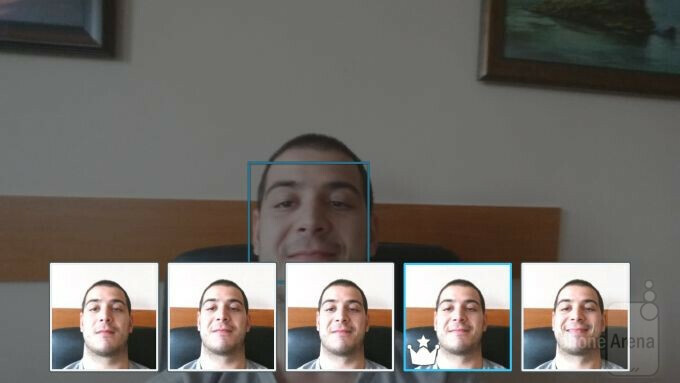 Indeed, picking among a number of pictures with Best photo is easy, and the software usually intelligently suggests the best results for you right away. As for Best face, this is especially handy when shooting people, as it allows you to change individuals' faces at will. In other words, if someone blinked during the snap, or just had a goofy face and ruined the shot, Best face lets you correct for that. Handy! At this point in time, the Galaxy S5's panorama shooting mode is one of the best there is, and that's a promise. But what does that mean? For starters, panos are shockingly hard to mess up, and even if you swirl around real fast. That means that the end product, all stitched-up and all, is seamless in its transitions, and I've not once come upon an issue that is due to poor implementation, stitching, or what have you. What's even more, the panoramas are simply gigantic in size (up to 33 megapixels! ), and the software dynamically sets the exposure levels, so that you don't end up with a pixelized image, or an overly dark or bright one. All of this may sound like standard stuff, but you'd be surprised just how often we, as a team, come across poorly-executed Panorama solutions. In all, the GS5 ranks among the best phones out there (behind the LG G3 and Huawei Ascend P7) in terms of pano quality, and, if you love shooting those, you'll also love Samsung's flagship. Excellent stuff! New on the list of shooting modes for any Samsung device is Virtual tour. Now, if it hasn't become obvious from the above panorama section already, I'm always intrigued by the promise of being able to create immersive, 3D-esque images/videos on the go, and that's why Virtual tour was likely the very first thing that I tested on the GS5, hours after it first arrived at the office. Anyway, what Virtual tour does is quite self-explanatory in a way -- you shoot a string of photos as you move about the real world, and the software stitches those together in something along the lines of a video (but you can't watch it outside of the GS5's gallery) of your trip. In a sense, it works very much alike to 360 panoramas (or Photo Spheres/Surround shot) in that it requires you to center your camera on a single blue dot on the screen and wait for a while before you start moving about. I've played around with Virtual tour for a while, and I've gotta admit it's a mixed bag. For example, the number of snaps you can take is not very high at all, and the more left/right turns involved, the more likely the software is to go crazy and ruin the tour. On the other hand, should you have the patience, you can actually produce acceptable results, though I do so wish I could speed up tours' playback pace, as it's just way too slow. Hopefully Samsung will look into that in the future. In all, I actually believe this has real application, but Samsung needs to either create its own online service where you can host these, or allow you to export them outside the GS5's gallery. There isn't a whole lot to talk about when it comes to Dual Camera. The feature, as the name implies, allows you to take images or shoot video with both cameras simultaneously, in a sort of picture-in-picture arrangement. I've not come across many scenarios to use this, though I do imagine that, in certain scenarios, it would be cool to have your own face in a corner as you shoot a beautiful landscape. There are also different styles for the frame of the smaller, secondary window, and, in case you're wondering, the size of said window can be tweaked, too. With Animated Photo, you have something a whole lot less pedestrian, and I've honestly grown to appreciate the creative spark this shooting mode can cause. 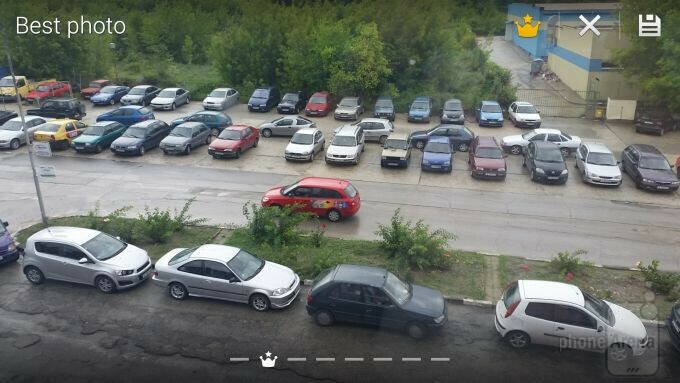 Explained in simple language, Animated Photo allows you to create a .GIF in which you can isolate certain areas of the image and freeze them, while everything else keeps on moving. There are far more creative individuals than me out there, and I bet that, put in their hands, the GS5 can be turned into an awesome GIF-churning machine. Few people seem to get my excitement over 360-degree virtual reality panoramas (Photo Spheres, or Surround shot in Samsung's language), but I find them simply magical. Unfortunately, while Google (who pioneered the feature for Android) has been improving the engine in charge of proper stitching, third-party Android skins rarely include this feature. Thankfully, the Samsung Galaxy S5 does, and the implementation is definitely not as bad as some others. In fact, Surround shot manages to churn out some relatively high-resolution photo spheres, though stitching errors are obviously a part of life. The example photo sphere above, for example, was shot whilst the GS5 was firmly mounted atop a tripod, and all the usual guidelines when shooting in this mode -- observed. A word of advise -- try and pick environments where you have at least 3 meters from the closest object in all directions, as this will lower the chance that the software will mess up the shot. Also, try and keep the dot on the screen (which indicates where your next shot should be) perfectly aligned in the middle of the circle, as this will also aid in stitching. While, strictly speaking, Selective focus isn't a separate shooting mode (which is weird), it does, in theory, allow you to shoot some crafty images with a fake bokeh background. Perhaps the reason it didn't make it as a dedicated mode, however, is the fact that the effect it introduces is downright tiny, and mostly not worth the hassle. Check the before/after shots for yourself. See the difference? Yeah, me neither -- it's downright tiny! Alright, so there's a small difference, minuscule as it is, so perhaps this isn't as bad as I'm making it out to be?! Unfortunately, no -- it really is poor, and mainly on account of the software's outright refusal to work constantly. Basically, you need to have the object you want to stay in focus at less than 50 cm distance from the camera, and any background needs to be at least 3 times that distance further back. Sadly, even when these highly limiting requirements are met, there are no guarantees that the software will bless you with a successful shot. And, as already mentioned, even if it does smile upon you, there's little practical benefit of even going near Selective focus on the whole. 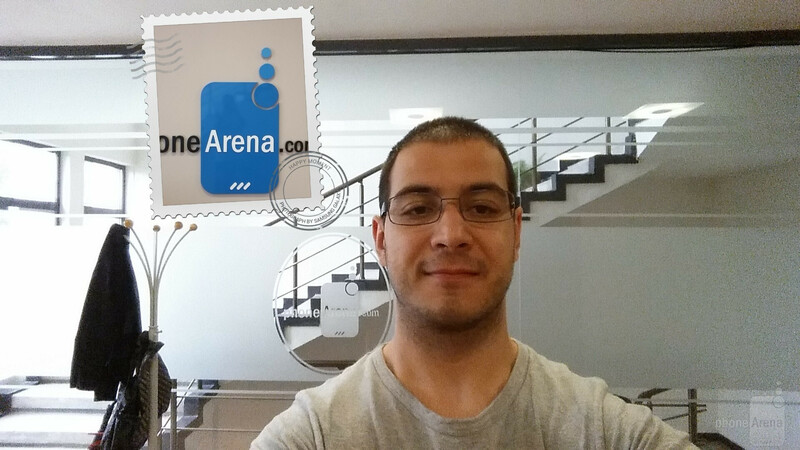 Another point of business today is the Galaxy S5's extremely powerful image editor. It would honestly take a dozen of paragraphs to do it justice, so I'll try and give you an idea of what it offers in a more concise manner. Perhaps most importantly (in the post-Instagram era), the S5's image editor offers some 20 different effects that range from pedestrian to downright cool (e.g. Pop art and Impressionist). These (like most every other editing you can perform in the app) can be applied to the entire image, or just parts that you want to highlight. Those can be selected with a lasso tool, or just good old circle/square selection. Apart from that, you can also tweak portraits (i.e. the software needs to detect a face for these to work), with tools like airbrush, red eyes remover, and face brightening all being readily available. There's another, rather trendy tweak available here called Out-of-focus, which simply creates a fake bokeh with mostly poor results. Moving on, there are also a number of color settings that let you change the tone of an image (or parts of an image), including tweaking of the color temperature, color saturation, contrast, and more. Lastly, you have access to fluff, such as labels, stickers, frames, and you can even draw on top of snaps. Apart from being an amazing all-rounder in terms of stills, the Galaxy S5 is quite the capable camcorder, too. Indeed, apart from the standard, 1080p resolution clips at 30 frames per second, the GS5 can also shoot silky-smooth 1080p clips at 60 framers per second. What's more, this being a 2014 flagship, super-detailed, 4K video capture is also available. Lastly, you can also shoot slow motion clips at 120 FPS and 720p resolution, or fast motion ones that speed up the footage up to 8 times. Across the board, we've been very happy with how the GS5 handles video, as it consistently ranks among the very best camcorders, at least for this flagship generation. Detail is abundant, exposure is dynamically tweaked, and well, and frame rate, even with little light available, is consistently high. Of course, the above mentioned abundance of shooting modes is not to be underestimated, either, and it definitely adds points to the GS5's overall video capture score. 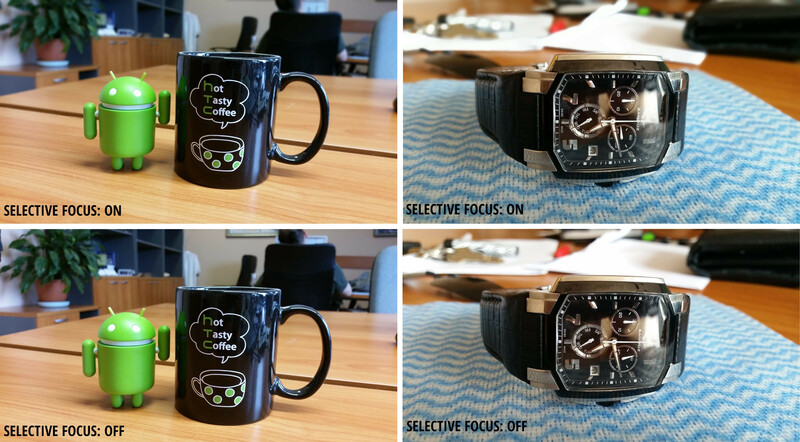 I've touched on the camera comparisons in which the Samsung Galaxy S5 excels. And while I'm not at all intending on taking that away from the GS5, it should be noted that you and me both usually snap photos with considerably less preparation involved, and little regard as to whether the particular scene at hand can at all be handled by a smartphone's camera, which, even today, has its weaknesses. In other words, most of us tend to use the default, Auto mode on our phones, and let the software handle the specifics that a scene dictates. But perhaps most profound of said weaknesses is smartphone cameras' inability to handle low light scenarios well. At least for now. The GS5, as high as it may rank on our list of great shooters, is no different, and poorly-lit environments often prove insurmountable. In my experience, in those scenarios the GS5's software simply refuses to slow down shutter speed enough in order to capture sufficient light, and that's probably because it prefers a poorly-lit, but non-blurry image, to one that is well-lit, but blurry (remember, the GS5 has no optical stabilization, so that's a factor too!). What's more, as exemplified by some of the shots below, the software algorithms are not at all flawless in poor light, and scenes that are overall dark, but have bright spots, are sometimes reproduced with severe color tinting (green and purple in the samples below). Once again, this isn't to say that the GS5 has a poor camera -- that's completely incorrect -- it's just a reminder that you're still dealing with a relatively tiny camera that is mounted on a phone, and it's certainly not without its limits. With that in mind, take a look at some snaps I took during my day-to-day wanderings (mostly night shots) and judge for yourself. A good example of a completely messed up night shot -- this green tinge is overpowering. No bright light sources equals a more realistic snap. Again, blurry image, despite me having relatively steady hands. How's that for a pink tinge? The same snap, but taken at 6MP. The reason for this is that, sooner or later, you'll find out that shooting full-sized, 16MP pictures both takes up a ton of space (about 4MB on average), and makes sharing pictures on the go a big problem. All for me, none for you! And that's about it for the Samsung Galaxy S5. I'll soon be handing the device back, and that means there's only one other piece on the horizon, at least as far as these series are concerned: a conclusion and final verdict. Stay tuned! http://www.phonearena.com/news/Living-with-the-HTC-One-M8-climbing-up-the-ladder_id56912 and please dont make such jelly comments, maybe Crispy got himself a s5 and John V got a m8, maybe they didnt like the z2 or 1520. HTC does not have the deep pocket to pay PA. PA also need advertising revenue and Samsung is willing to pay lots of it period. Samsung pays so PA post it. The only thing left missing is rename this site to SamsungArena or GalaxyArena. Its S5 everywhere. I didnt see a 4-week review of G2 and M8. Did they do that too? Marketing is seeing your products everywhere. Good or bad its still exposure. Brand retains in your mind. S5 here, S5 there, even S5 in ads. S5 everywhere. Do you think its coincidentally not marketing? Seems like you're a little jealous. I like how you are giving each aspect of the Galaxy s5 a close personal look and tell us how the experience was. And from what I can tell this phone really is just a monster. And the best phone out there right now. the g3 comes close, but the screen leaves a lot to be desired. Can't wait till the s5 gets dethroned bus it's own kin. The Note 4. As much as I'm not a fan of TW, the S5 is still the best Android available IMO. The camera on it is outstanding. Just got back from vacation and the pics my wife took on her S5 kill similar ones taken with my N5 and brothers iPhone 5. The options are a little intimidating since there are so many to pick from and makes the stock camera on my N5 seem like the most basic camera around, which maybe it is. Touchwiz camera app has always been the best. There's still no match for new S5 camera app on the market. Yes I hate touchwiz for its ugliness and the bloated nature that slows down device, and that brings down android reputation. But I like the awesome touchwiz functionality. :) also liking what i dont like would make me sheeepy. sumsung is best when its comes to camera , nokia is just bragging all day about their camera but i've seen nokia 920 photo's and campred them to the ones with s4....s4 was much better ! Sooner or later your sLag will slow down and start to show its true colors. I had a s3 a while back and even the dailer lagged. LAG LAG LAG LOL even removing the phone from your ear after a call there's a delay for the screen to come on. Excuse me? If I wasn't smart enough to operate a smart phone I wouldn't know how to pick out lags in between switching simple tasks. You had an s3 and it didn't lag? Can you please sell me it? I'd love to buy that oh so special s3 cuz it's one of a kind. The S3 does lag. Hell, my dad's S4 even freezes, let alone an S3. But it doesn't mean they're not usable. They're class-leading when it comes to chipsets, Sammy always gets the best available chipsets around. Even if it lags, you don't have to be such a, in sar44's words, noob-hater about the S3. Oh god, I wish I had the money to buy an S5. As much as I hate to admit it, Samsung makes flagships that are standard-setters. In the camera department, the S5 is the smartphone to beat (Lumia 1020 is a beast, but I'm not so sure about the OS and shot-to-shot time). And as much as I hate their phone design, I think the white S5 (Shimmery White?) looks elegant. Maybe Samsung makes ugly phones and bloated UI. But people still buy their phones. And they make a hell of a lot of money.